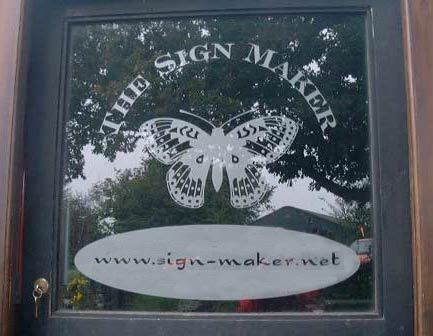 Whether for home or business signs we supply vinyl film, cut any way you want, for signs or decoration. The film can be supplied in solid colour, translucent colour or frosted. There are two ways you can order the vinyl window film. You can send in ready to cut artwork or tell us what you want and our designers will create your window sign for you. We have loads of fonts and standard images you can choose from. Your window sign or sticker is supplied to you on application transfer tape ready for you to apply - full instructions included. 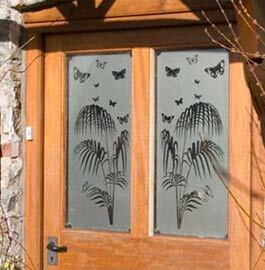 The most popular choice is the frosted window vinyl film. 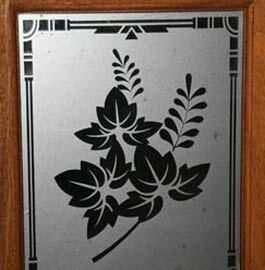 We have two choices here:- The Standard Frosted Window Vinyl, which should be applied using the wet application method. Or the new Frosted Window Vinyl with special air release adhesive (helps get rid of unwanted bubbles) which can be applied dry. The transluscent colours can look amazing - they let the light through. Another option, especially for shop signs is to have solid vinyl letters with a translucent or frosted vinyl film behind. There are big discounts for more than one item. The possibilities are endless - it is up to your imagination! Click here to see all the vinyl colours along with prices. Or go the the shopping cart link below which will calculate the cost and again give you the colour options. If it all seems to confusing - email us and we will send you a quote!